Meter Polypropylene Binding Covers 600 micron are heavy duty, extra thick durable report covers that give your documents a professional look. Also known as Poly Covers or Polyprop Binding Covers they are primarily used for front and back covers on documents bound with Combs, Wire & other binding systems. Polypropylene Binding Covers provide extra protection for your documents and presentations as they won’t crease and give your reports a rigid backing. Meter Polypropylene Binding Covers are made from environmentally friendly materials that are acid free and can be recycled. These covers are great for Instruction Manuals and reports that need to be used in the workplace and hard wearing environments. Polypropylene Binding Covers are a step up from traditional Binding Covers and provide increased durability and document protection. 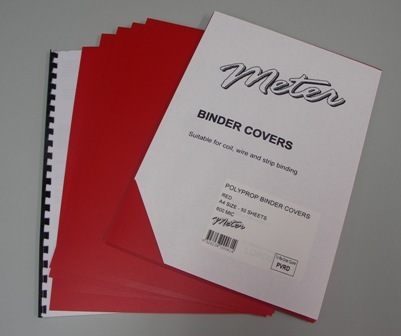 Meter Polypropylene Binding covers are tear proof, waterproof and incredibly robust. 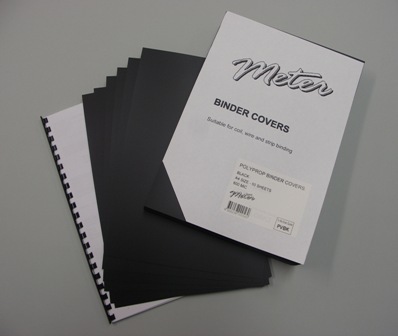 Polypropylene Binding Covers are available in A4 and A3 Size. Other sizes can be cut to requirement (phone or email for pricing). Round Cornering also available. Polypropylene Binding Covers can be used with all Comb, Wire, Coil, Strip and Velobind Binding Machines. For more information and pricing please see links below.